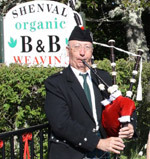 Pierre and Christiane Lebrun warmly welcome you to Shenval organic Bed & Breakfast near Loch Ness and Glen Affric, close to Cannich, Beauly and Drumnadrochit, in the Highlands of Scotland. Comfortable holiday accommodation only 30 minutes from Inverness by car. In a prime outdoor area next to Glen Affric National Nature Reserve and Corrimony RSPB Nature Reserve, Shenval B&B promotes green tourism and is the ideal peaceful and relaxing location in a quiet rural setting, close to mountains and sea. It is also an excellent touring base to visit the Scottish Highlands, with the Loch Ness circular tour, Ben Nevis and Glencoe, the Isle of Skye, the Cairngorms National Park, the North-West Highland coast and the Whisky Trail all within 2 hours drive. Free Wi-Fi. Walkers, cyclists and bikers welcome. No smoking and no pets please. Open all year.